Tonight marks four weeks in the hospital for Rima. She has been fever free for seven days, wooohoooo! For a majority of you, our readers, spending over two weeks in a hospital is something you may never know or have to deal with. But, for those of you who have had to spend long periods of time in a smelly hospital then you will know what I'm describing in the next paragraph. There are a few stages of emotions that happen with hospital visits. They can vary from person to person but overall I feel like a majority of frequent hospital goers can relate the the following. 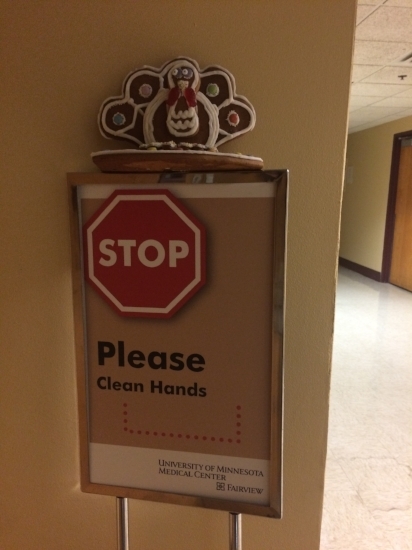 For Thanksgiving Rima and I made a gingerbread turkey from Trader Joes. I got a christmas themed one for us to make a couple days ago. Rima was entering her fifth stage of living in the hospital at this time, wackiness. She suggested instead of throwing Geraldine into the garbage, instead to run around the hospital underbellies at night and take photos of her in funny locations and then to leave her down there with a note. She wanted someone to find her in a dimly lit hallway and get freaked out. I willingly and excitedly joined her in on this wackiness stage. So, last night Geraldine had her great adventure. We hope you enjoy it, because I'm pretty sure we've lost it, and by it, I mean sanity.